Tristan Ely - What's going on in Mr. Solarz' Class? 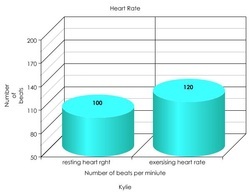 When I became more active my heart rate went up a little bit. It went up by 10 beats when I was more active. When I was more active it changed because I was moving more so my heart was working harder. So it was working harder because it had to pump the red blood cells to my body parts that needed it. Previous work Experience: I worked as a tailor, Seamstress, and Shoemaker for the Prime Minister of Australia. Useful Skills for this Project: I can make clothes and shoes. This will help because we will be there for a long time. With my free time I: Like to swim in the Barrier Reef, sew, and make shoes. What Kind of Music do you enjoy: I like music that is made with the didgeridoo. Some personality traits that are important for this trip: cooperation, compassion, enthusiastic, flexible and determined. What are your reasons for wanting to join the space colony: I want to join the space colony because it is a once in a lifetime opportunity. I might never be asked to do this again.